We are dedicated to our iPhones, but our commitment to our virtual social lives comes at a cost to our health. Recently coined as the “iPhone syndrome,” overuse of mobile phones causes poor posture and unnatural hand positioning, resulting in straining of the nerves, muscles, and tendons in our fingers, wrists, arms, hands, and neck. The hands are especially affected, as they are busy performing countless actions. RSI occurs when microscopic tears cause muscle injury. As there is no interval of rest, the muscles have no opportunity to recover. Muscle swelling can lead to nerve compression. One possible injury resulting from a compressed median nerve in the wrist is carpal tunnel syndrome. Proper technique is crucial for the prevention of soreness and pain from RSI. When typing or texting, try to keep wrists as straight as possible, to alleviate stress put on the delicate muscles. 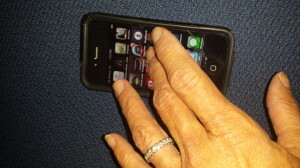 Use both your thumbs while scrolling or typing: alternating fingers and pressing lightly will divide the work and prevent overuse of your thumbs. The best way to both prevent injury and cure RSI is to take breaks and rest. Allow your hands and wrists an interval to relax and stretch. Stretches, gentle massages, heating/cooling pads, elastic supports, and firm splints may all help relieve pain due to RSI. The best way to prevent or treat an injury is to put away your phone. Rest is the surest way for the body to recover. If you continue to experience pain, despite change in phone habits, visit an upper extremity specialist, Dr. David Edelstein. To schedule an appointment, call 718-283-7400. Please send us your iPhone – Friend or Foe? questions or any questions to our friendly staff via our online Contact Form. You may also contact us at or visit our office at 6010 Bay Parkway, Brooklyn, NY 11204.